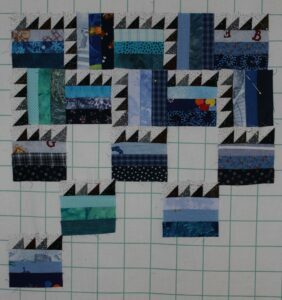 My 2 1/2″ strip bins were getting full and I have a 2 1/2″ Trapezoid ruler by Creative Grids that I had never used. Both of those reasons collided together to make the Rainbow Braids. They are easy to make and lots of fun. 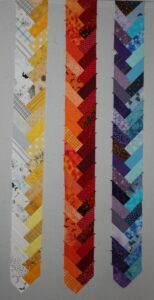 I like the idea that I don’t need to trim off the sides to attach them together even though for this project I think I will put sashing strips in between the braids.